The University of Maine at Presque Isle’s Maine Solar System Model celebrated its 10th anniversary on Friday with a short press conference and the announcement of a proposed expansion into Canada, which would make it the very first international model on record. The Maine Solar System Model was formally dedicated on June 14, 2003, after four years of construction. The installation, which is one of the exhibits maintained by UMPI’s Northern Maine Museum of Science, remains the largest solar system model in this hemisphere, with a scale of 1:93,000,000. At this scale, one mile is equal to the distance from Earth to Sun, known as an astronomical unit. The Sun is located inside Folsom-Pullen Hall, with the planets and dwarf planets located south along Route 1. The model is a major summertime destination, bringing tourists from all over the country, and even around the world, to the region. “Science, of course, does not stand still, and since the original construction of this model, astronomers have expanded our knowledge of the solar system and developed the new classification of ‘dwarf planets’. Our model must similarly develop to reflect these changes,” Dr. Kevin McCartney, Director of the Northern Maine Museum of Science and coordinator of the Maine Solar System Model, said. Dwarf Planets are smaller and typically have more elliptical orbits than planets. Dwarf Planets are of sizes great than 400 kilometers, which provides enough gravitation attraction to create a spherical shape and clear the surrounding area of debris. McCartney said most of the Kuiper Belt Objects to be included in the model are “dwarf planet wannabes”. Two Kuiper Belt objects, Haumea and Makemake, have recently been approved as dwarf planets, while the others are pending. Three dwarf planets are currently represented in the model: Pluto, Ceres and Eris. a fifth location yet to be determined. 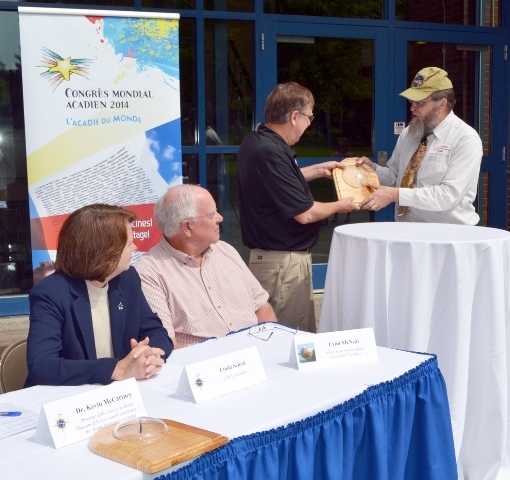 Officials hope to have displays in place in time for the World Acadian Congress. The 2014 Congrès is the first to take place in two different countries. After more than 200 years, the world of Acadia is expanding to include northern Maine Acadians. 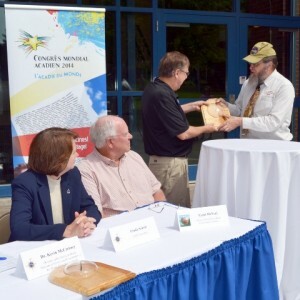 A Congrès Mondial Acadien takes place every five years in an area where Acadian descendants have settled: southeastern New Brunswick; Lafayette, Louisiana; Nova Scotia; northeast New Brunswick; and now to an area known as L’Acadie des terres et des forêts (Acadia of Lands and Forests) that encompasses the Valley, northwest New Brunswick and Témiscouata, Quebec. It is expected that approximately 50,000 visitors from a variety of countries will be here to “discover” Aroostook County. Tentative plans are that there will be a new brochure about the dwarf planets and Kuiper Belt Objects that are part of the model once funding is found. The brochure would be in English and French to be distributed as part of the World Acadian Congress.